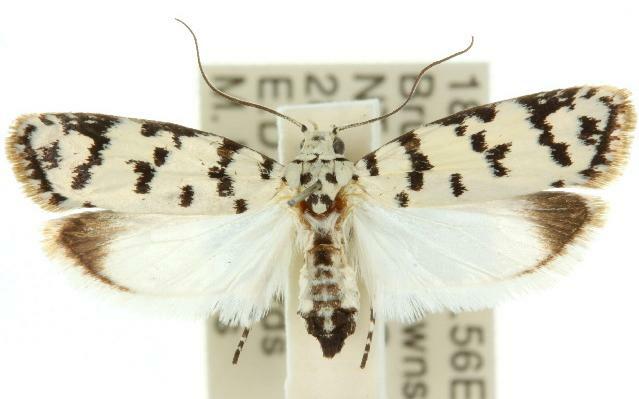 The adult moths of this species have white forewings, each with a pattern of black spots, and white hindwings with grey-brown wing-tips. The head is white. The thorax is white with black spots. The first and last abdominal segments are black hairy, with brown segments in between with white intersegmental hairs. The wingspan is about 1.8 cms. This species is similar to Ethmia postica, but smaller, with slightly different markings, and a differently coloured abdomen. Volume 27 (1903), pp. 227-228.